Website Introduction. The objective of this website is to gather the great prayers written by the spiritual visionaries of our planet into an online database representing all life affirming traditions. Many of these prayers have been used for hundreds if not thousands of years. Others are from spiritual contemporaries in today's intricate global fabric. Though these sacred verses arise from divergent paths, voices, languages, cultures and heritages, they all carry within them the same burning flame - the same impassioned love for life and the divine mysteries. 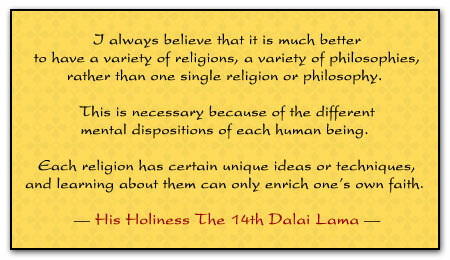 A comment from the Dalai Lama on religious diversity. Guiding Principle. The World Prayers archive attempts to be representative of all life affirming faiths and spiritual practices without preference to any one. It is our goal to make these great words available to everyone for study and appreciation. The prayers have been intuitively divided into four categories for the purpose of organization and navigation. Instructions. Clicking on any of the four category links surrounding the borders of the main browser window will return a RANDOM prayer from the chosen category. You may navigate through the prayers in this spontaneous and casual way or you may SEARCH the collection by religion, author, keyword or phrase. The prayer INDEX allows you to easily browse through the prayers by category or religious tradition. Donations. The continued development of this project depends entirely upon the financial support of the public. Your Help is Essential !!! Nonprofit Status. 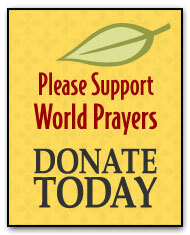 The World Prayers Project is a 501(c)(3) nonprofit public charity registered in the State of California. All donations are tax deductible. Acknowledgements. We offer a special thanks to everyone who has helped in the creation, support and encouragement of this website. And our deepest gratitude goes to the many sources and inspirations of these remarkable prayers.